We were completely out of baby wipes and while rushing through Walmart, these shiny hearts caught my eye. I grabbed them and stood there turning them over in my hand until I knew exactly what Valentine’s Day craft I was going to make with them! 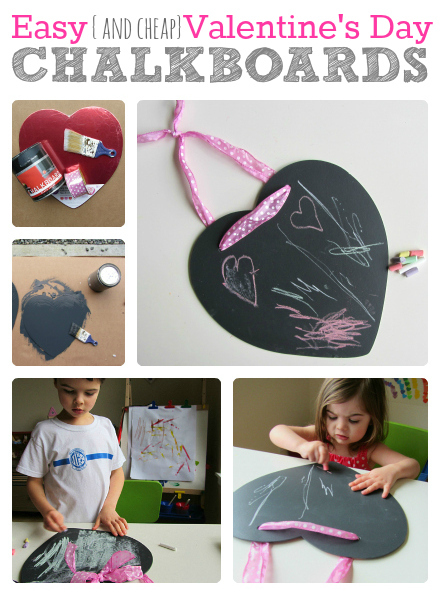 Simple Valentine’s day themed chalkboards. 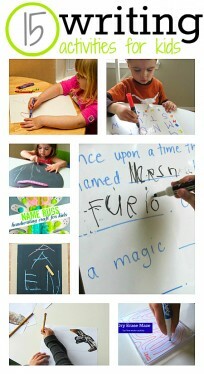 My kids love chalkboards and I love anything that inspires them to draw and write. 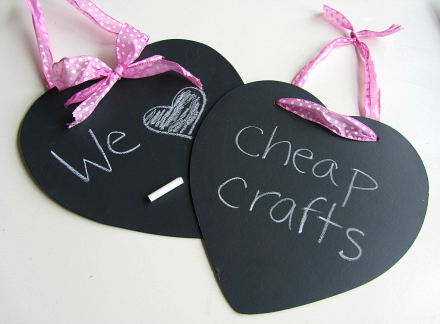 The pack of 3 Wilton cake platers cost me $3.95 , the ribbon cost a buck and this chalkboard paint has been in my garage for years. Gather your materials. 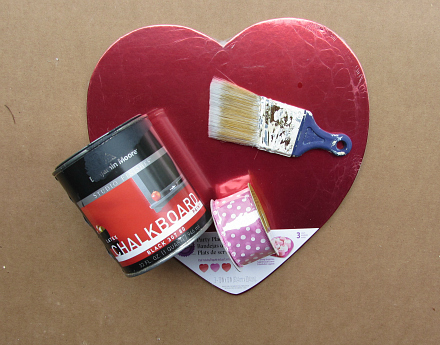 For this Valentine’s Day craft, you will need the cardboard hearts , scissors, chalkboard paint, a brush, something to protect your floor/table, something to make a hole in the cardboard with (I used a Robertson head screwdriver and a hammer but I bet a pen would work), ribbon and chalk. Start by painting your hearts. I painted one on the shiny side and one on the plain cardboard side. I wasn’t sure if the paint would adhere to the shiny surface. I am telling you Benjamin Moore really is rad paint. After they were dry you couldn’t tell a difference at all. Let dry. Thread the ribbon through. I decided to do two different styles. You will probably want the ribbon to be wired just because it makes threading it through the hole a breeze. Time to write! I tested it out first to make sure it would erase well. It did. Then let my little ones go for it. My son was initially unhappy that the ribbon was pink but as I went off in search of a different color he called me back saying it was OK. Perhaps the anti pink phase is waning? One can hope. 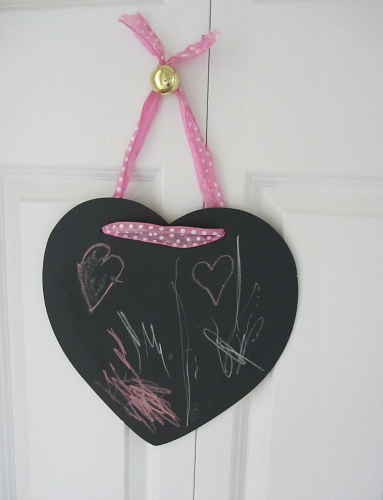 After they decorated their hearts, I hung them up in our hall way to add to our Valentine’s Day decor. I think these would be fun gifts for your kids on Valentine’s Day too or you could make these Monogrammed Hearts I created for Melissa & Doug’s blog last week. 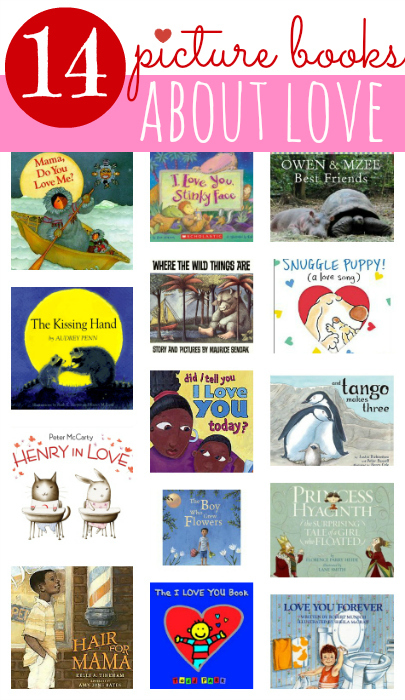 Check out our recent round up of great picture books. This list is all about love in all different forms. Read all 14 book reviews here. For more great Valentine”™s Day craft ideas follow me on Facebook! Oh my! 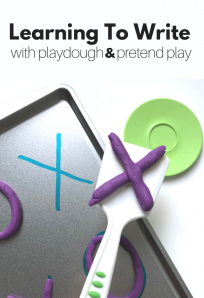 I love this idea and we are looking around for ideas for Valentines for my kids’ friends (yes, a bit last minute, I know!) so these might be perfect. 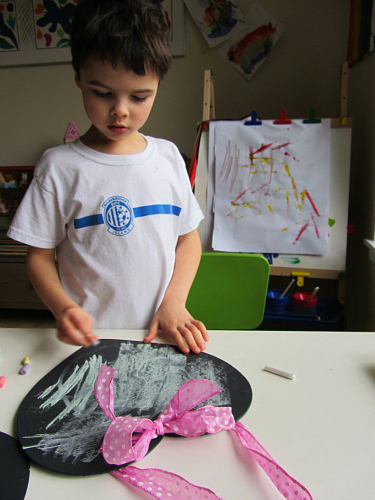 With a bit of chalk taped to the bottom – awesome!! Wow, I love this!! 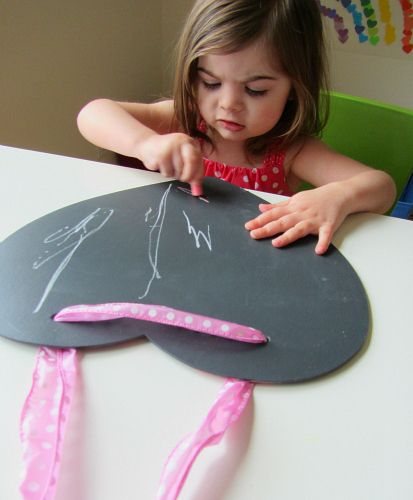 I’m pretty sure my son and his playmates would have a blast with the chalkboard. That is really clever. Love it. Love this idea. 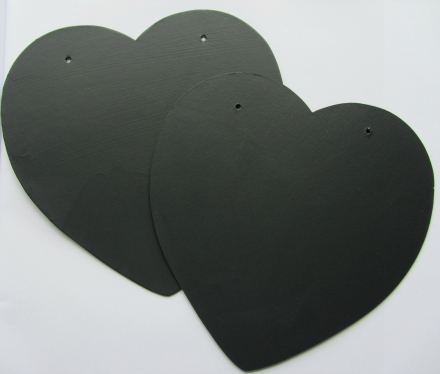 Are the chalkboard hearts made out of the cardboard or the platter? 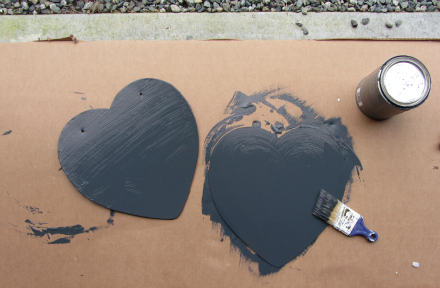 did you paint both sides of the heart with chalk paint? Or leave it plain or paint it another color? Those hearts are almost $5 now. Only one side – and I can’t believe the price has jumped that much! This is fantastic! 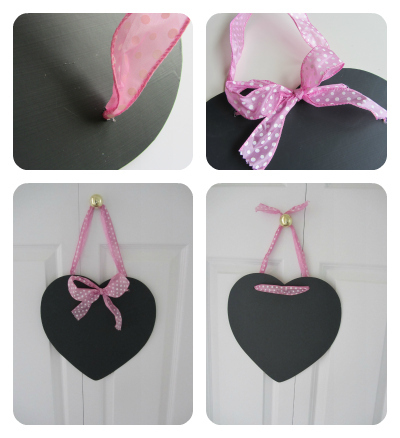 I’m hoping to do this with smaller hearts for a classroom craft. About how long did it take for the paint to dry? Do you think fourth graders could handle the painting? Does it just go on like regular paint or is there technique to it? Did you get that coverage after one coat? Thank you!! I think 4th graders would easily be able to handle this. The paint goes on great if you get good quality. You will want to have 1-2 hours drying time between coats, especially with kids who might get thinker coats on. Two coats is plenty.